SECRETARY GENERAL OF CBCI: RELIGION IS ABOUT LOVE OF GOD AND LOVE OF NEIGHBOUR - CAN NEVER BE ABOUT HATE! 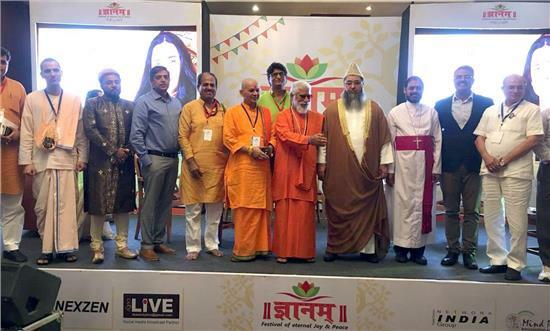 The Catholic Bishops’ Conference of India participated in the “Festival of Joy and Peace” organized by Gyanam, a Right wing cultural organization in Jaipur on 8th September 2018. Speaking on the topic the Religion (Dharam) as Faith (Aastha), Behaviour (adhambra) or Pageantry (Aacharan), Bishop Theodore told the audience that Religion is a relationship of Faith and love with your God. This love transforms itself as love and mercy to all other human beings who are our brothers and sisters. Of course there is also some glamour to represent the transcendence of God and therefore, there are also beautiful Churches, Temples, Mosques, Gurudwara where people go to pray. Swami Sushil Maharaj Goswami came out strongly against those who wished to impose one religion on others and to divide this country on the basis of religion. Bishop Theodore asserted that hatred can never be promoted in the name of Religion. When the Alawar MLA defended cow lynching, Bishop Theodore taking objection to his comments asked him whether out of his respect for the cow, whom he called the mother of Hindus, he would request the Central Government to ban the export of beef. The comment was greeted by thunderous applause. The MLA could not answer his question. He excused himself saying it was out of his jurisdiction and that the Central Government has to take a call. Dr. Imam Ilyasi speaking about the cow slaughter, said innocent people were being killed in the name of cow slaughter. Dr. Ganesh the anchor accused the Religious Gurus of only preaching and not really speaking about the problems of society the way politicians were doing, Bishop Theodore retorted that the Anchor of the program probably did not know or understand about the work of Christian Gurus who are involved in education and work at the grass root level. His comment was greeted with loud clapping. The Panel discussion was a great opportunity to put forth to the audience the case for social harmony and to portray the good work of the Catholic Church. At the end of the show, Bishop Theodore was congratulated by many people for his beautiful delivery and as one person put it, for “his uplifting thoughts”.